With over 206 bones in the body, it’s not surprising that broken bones send many people to emergency rooms across the country every day. The American Association of Orthopedic Surgeons (AAOS) reports that six million people will break a bone each year. While many people regard a broken bone as a simple, straightforward injury, these types of injuries are often anything but. Broken bones can require surgery, extended healing time, rehabilitation, and more. These injuries should be addressed seriously as they can cause lasting damage and leave victims with lingering pain. The hundreds of bones in the body are made up of both calcium and collagen, making them hard but flexible. Throughout one’s life, the bones are constantly being renewed, with new bone tissue forming to replace old, worn out tissue. Bones serve a number of purposes for the body, including serving as a structural frame, helping bodies to move, protecting internal organs, and housing vital sources of blood, marrow, and key minerals. It is important to note that not every broken bone injury victim will exhibit every symptom. In some cases, it can be difficult to know if the bone is broken. Accident victims should always seek prompt medical treatment to ensure that their injuries are properly diagnosed and treated. Open fracture – pieces of the bone are sticking out through the skin. Closed fracture – the break is contained under the skin. Simple fracture – the bone is broken in just one place. Compound fracture – there are multiple fractures in the bone. Displaced fracture – the sides of the broken bone have moved out of alignment. Nondisplaced fracture – the bone remains aligned despite the fracture. Bone fractures can be described with more than one category. A person could have, for example, a closed simple nondisplaced fracture. Additionally, there are other types of fractures that can occur, such as a comminuted fracture, in which the bone breaks into three or more pieces. Some of these complications, though rare, can require additional medical care and further recovery time. This can mean further pain for the victim and more time away from work, adding further physical, financial, and emotional stress to an already frustrating situation. 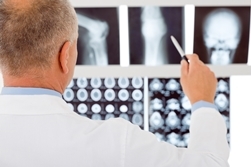 The most common causes of broken bone injuries include falls and motor vehicle accidents. Many times these accidents are the result of another person’s negligence. When others fail to live up their duty to act in a manner that promotes the safety of everyone, they can be held accountable. The serious injury attorneys at the Morris James Personal Injury Group have helped many Delaware accident victims obtain the compensation they need to help them heal and move forward. If you or someone you love has suffered a broken bone as the result of someone else’s negligence, you may be eligible to file a claim. Take a moment to fill out our online contact form to hear back from one of the experienced serious injury lawyers at the Morris James Personal Injury Group and learn more about your rights. What Kind of Compensation Is Available in Delaware After an Accident?